It was a gorgeous day to be outside so I took the streetcar to High Park. 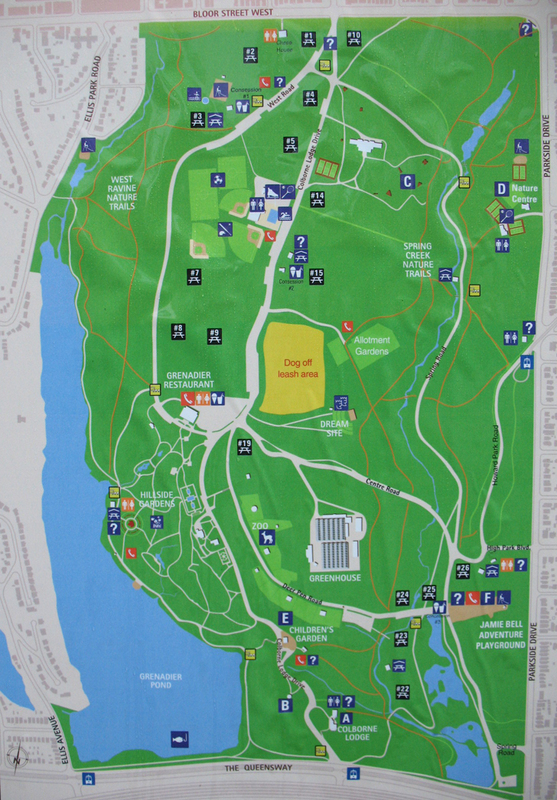 High Park is a municipal park in Toronto, Ontario. It spans 161 hectares (400 acres) and is a mixed recreational and natural park, with sporting facilities, cultural facilities, educational facilities, gardens, playgrounds and a zoo. One third of the park remains in a natural state, with a rare oak savannah ecology. High Park was opened to the public in 1876 and is based on a bequest of land from John George Howard to the City of Toronto. It is the largest park entirely within the city. I used to live a block north of High Park for five years in the late 1990s and would take my dog to the park often on Sundays. I miss being so close to it. 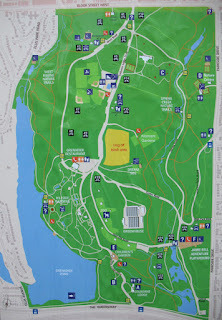 It's a great park because there is something for everyone and lots of space. I entered the park at the Queensway/Colbourne Lodge Drive and headed NW and followed Grenadier Pond. It's hard to believe I'm in the largest city in Canada! I walked east along Bloor Street W.
These guys were cute ... it was some sort of sing-along. I headed back into the woods as soon as I could (just east of High Park Avenue) and headed south. There is an off-leash area for dogs. It's huge! Be careful to lock the gate! The walkway is l-o-n-g with lots to sniff! After spending time watching the dogs, I got back on the path again. I spent some time in the small zoo. The practice of keeping animals in the park originated in 1893, with the keeping of deer. Today the zoo keeps American bison, emu, llamas, peacocks, fallow deer, wallaby, capybara, Highland cattle, yaks, Barbary sheep and Mouflon sheep. The baby animals were a bit hit! I left the zoo and got back on the trail towards the Queensway. I was at the park for about three hours and took 10,400 steps. I'll have to get back soon!